This week has been busy! 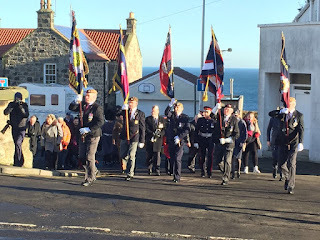 Sunday was the unveiling of the Victoria Cross Centenary Stone in Kinghorn which you can read about - http://www.kathleenleslie.co.uk/2017/11/today-centenary-victoria-cross-stone.html . 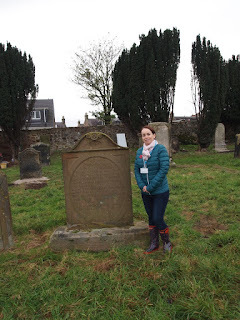 I cannot help but think more has to be done to push and publicise the rich history of Fife and many of its smaller towns and villages. 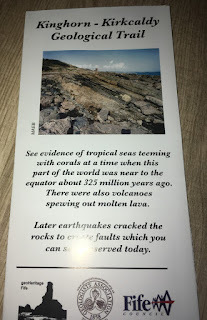 Over the past few weeks I have visited sites that would not feature on any "tourist trail" as such but are of huge historical significance and for the erstwhile traveller and lover of history they are gems worth visiting. Fife gave the world Adam Smith and Andrew Carnegie but it has so much more.There is extensive royal history around Fife, both pre and post Union of the Crowns, there are geological finds along the coastline between Kinghorn and Kirkcaldy, and there are ancient churchyards and burial sites (pre and post Reformation) that could possibly date back as far as the 6th century. A report was presented to Committee by two Police Scotland officers, covering anti-social behaviour, 101 calls and CCTV work with communities. 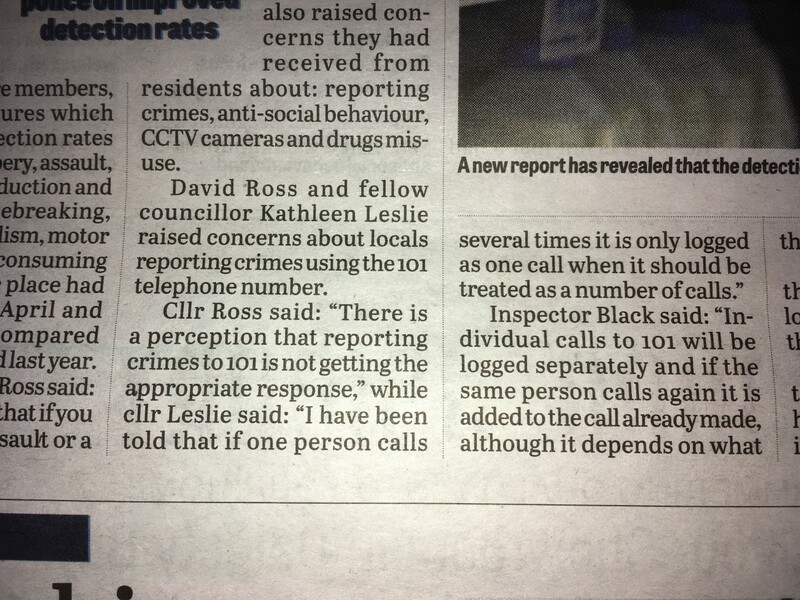 Concerns raised at the Community Engagement Meeting in Burntisland earlier in the month were in regards to 101 calls and their being logged - find the link here - http://www.kathleenleslie.co.uk/2017/11/in-touch-this-past-week.html . 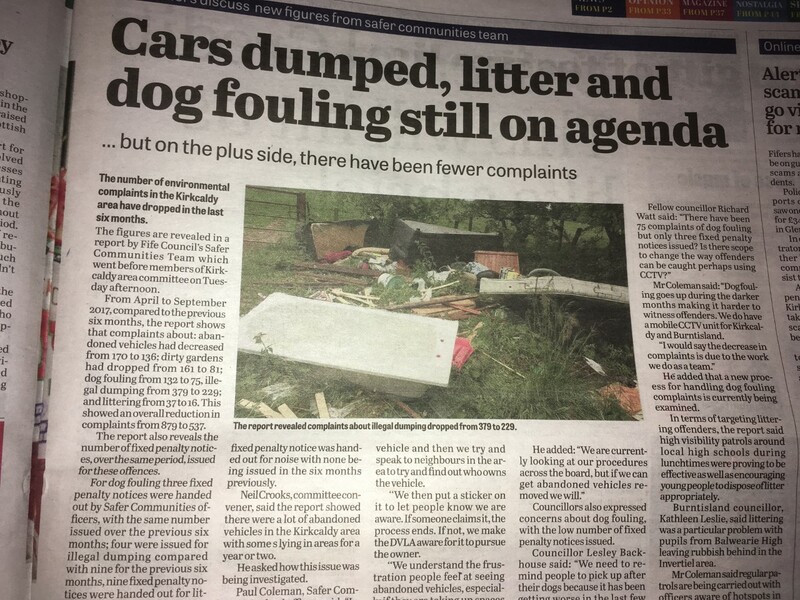 Following that meeting and points raised the week before at Burntisland Community Council I had asked how 101 calls were being logged, I did this once again at the Area Committee. 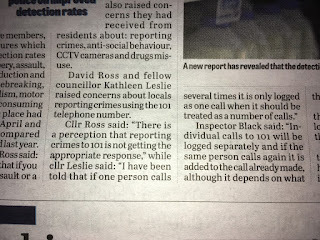 There is a concern (which I am not wholly convinced has been answered) that if one person in a neighbourhood is making several 101 calls of an evening then this is only recorded as one "incident". Police officers assured me that was not the case and that all are logged. I also asked about the mobile CCTV van, of which there is only one of in Fife. This was more of a probing question due to the non-transfer of operational responsibility for CCTV when Police Scotland was established (again see my previous post). My feelings are this needs investigated further and I intend to pursue a couple of aspects of policing in Fife - watch this space for an update. 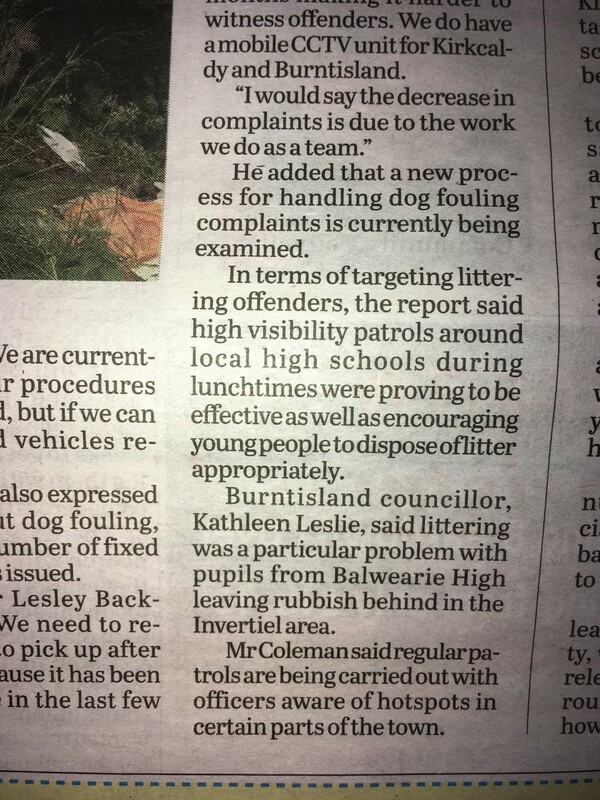 On a positive note, crime statistics across the Kirkcaldy area are down and continued engagement with youngsters is proving positive in reducing some aspects of youth anti-social behaviour. Are 101 calls being appropriately logged or are positive statistics paramount? 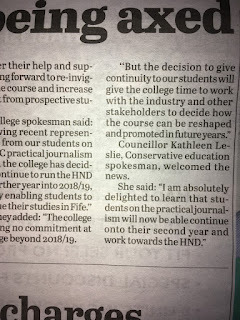 Last week students at Fife College who were in their first year of a two year HND in Practical Journalism were informed that the second year would not run. 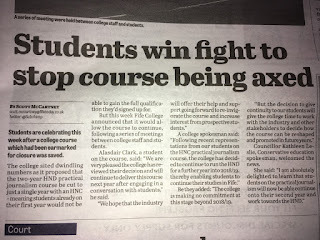 This left students in a very worrying situation whereby they had signed up for a two year course, with the second part leading them to work towards exams in achieving the NCTJ qualification - which much print media employers would be looking for, not running. An option of completing the course is apparently available through a link with Sunderland University. However, not all students have the means or the time to do that. 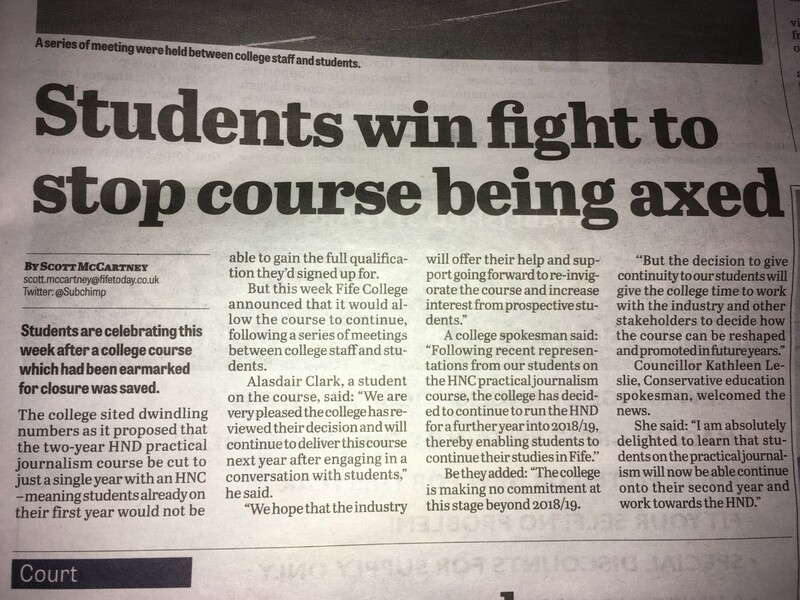 I intially wrote a press statement expressing my deep concerns about the proposed demise of the course but was, happily, able to update that when the programme was given a reprieve. 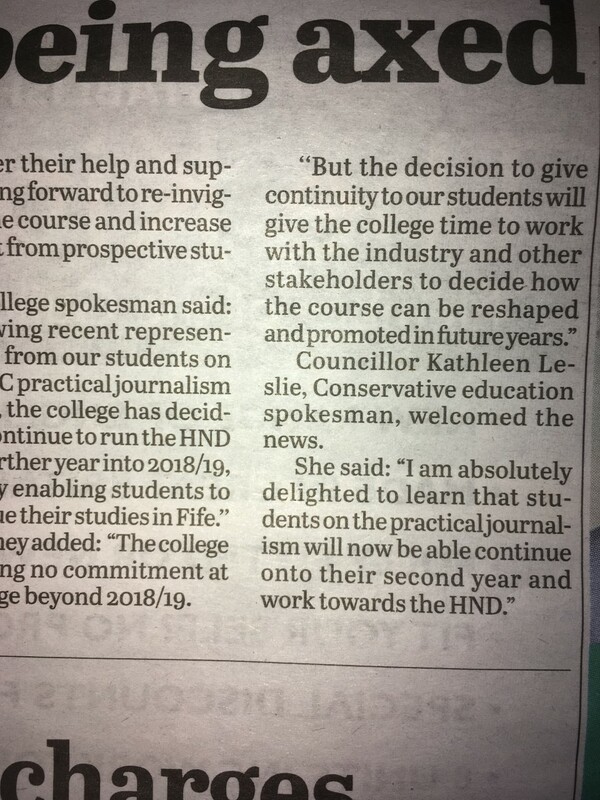 “I am absolutely delighted to learn that students on the Practical Journalism will now be able continue onto their second year and work towards the HND. Without the second-year students would not have had the opportunity to gain the NCTJ qualification which most print media are looking for when hiring. Students from around Fife and Scotland believed they were setting-out on a two-year course and for them to have been told at this stage in the year that they would not be able to progress caused a great deal of uncertainty and was quite simply unacceptable. 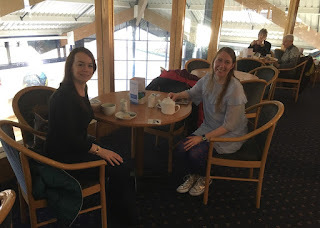 Unrelated to that I had met with a journalism student around the same time who wished to interview me about disabled access at Burntisland Railway Station. I was more than happy to take part in this as the lack of access is deeply concerning. There are five railway stations in Fife which do not have full disabled access and when I investigated Network Rail's Access For All Fund for station upgrades none of those in Fife are in line for funding. The lack of access is of concern to my two ward councillor colleagues and we shall continue to pursue a solution. In the meantime I absolutely encourage anyone experiencing accessibility issues at Burntisland or Kinghorn to please contact me - I want to hear from you. 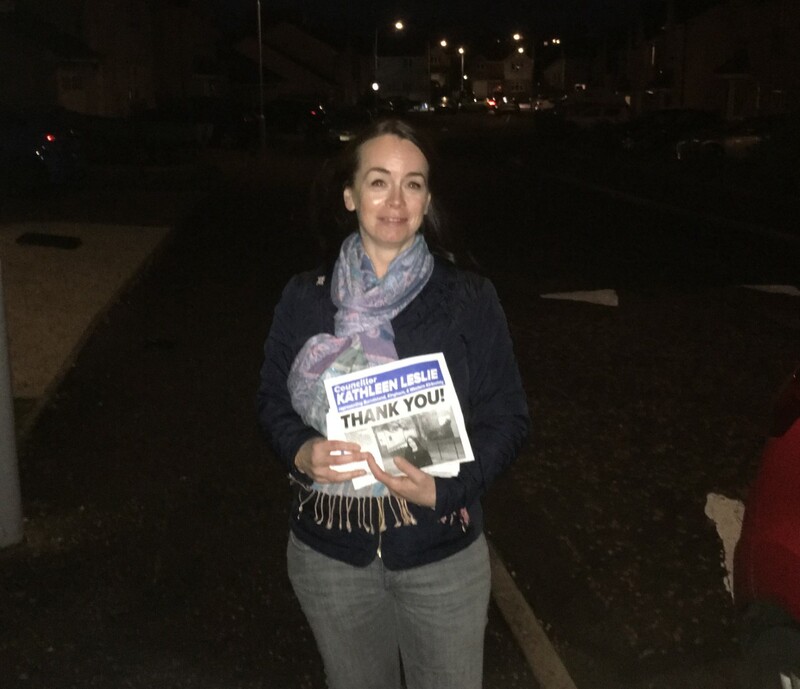 Despite the chilly weather conditions I have been out and about delivering my councillor leaflet which lets people know what I am up to and also gives residents the opportunity to contact me with anything they wish to be addressed. 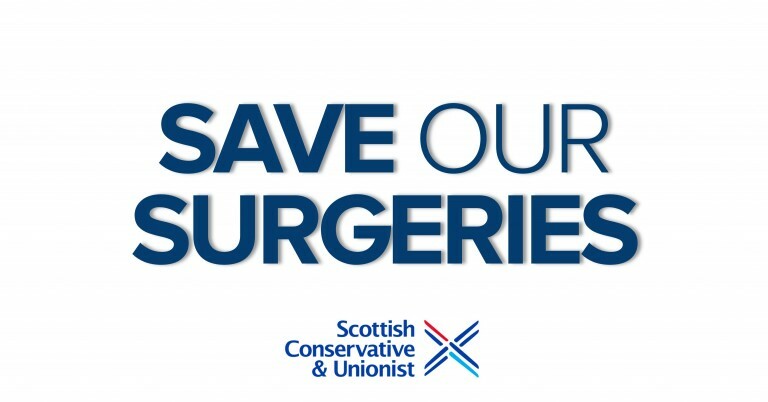 If you are unsure if it a matter for an MP, MSP or Councillor do please still get in touch and I will direct you if necessary to the relevant representative if it is not a Council matter. Thank you also to those who have already been in contact via email and 'phone. 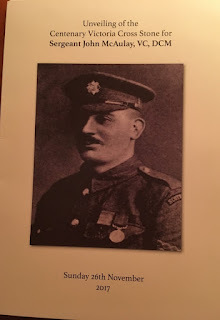 During the Battle of Cambrai on November 27th, 1917 non-commissioned Officer, Sergeant John McAulay, whilst under heavy enemy fire, carried his, what was to be, mortally wounded commanding officer, Arthur Kinnaird, to safety. Two German soldiers tried to intervene and thwart his heroic act but failed. Sergeant McCaulay continued the brave fight, taking command of the company, and battled on, rallying his men to push back the German attack. 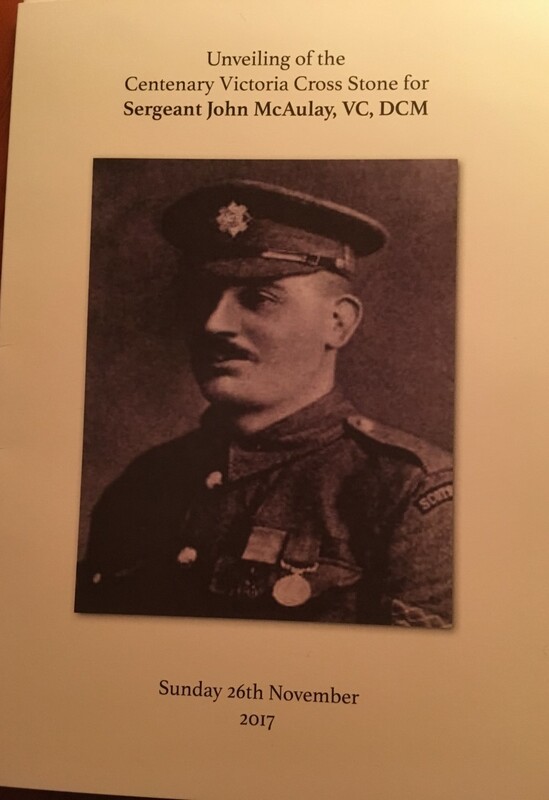 He was recommended for a gallantry award and was presented with the Victoria Cross (the highest award in the United Kingdom) in 1918. 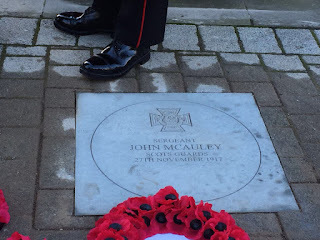 Sergeant McAulay was born in the Royal Burgh of Kinghorn in December 1888, joined the Glasgow police in 1911 and at the beginning of the Great War served in the Scots Guards. 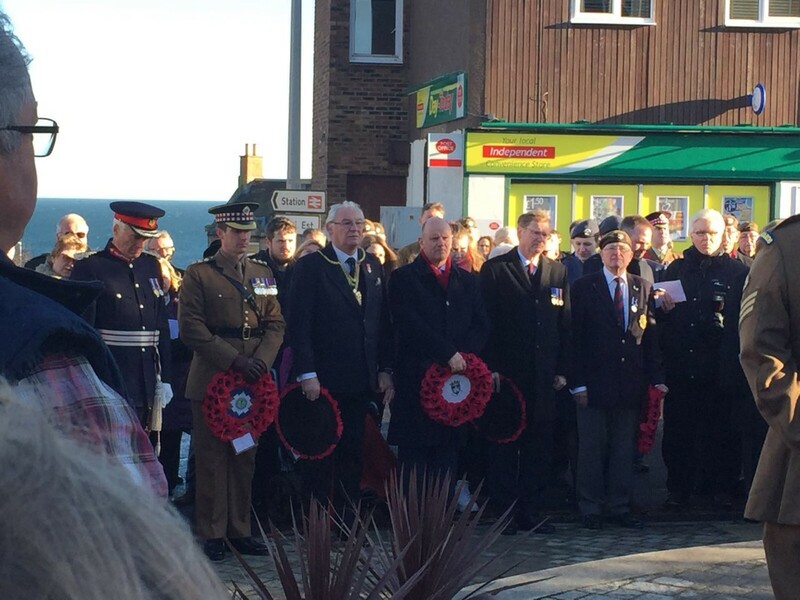 Today, in Kinghorn, his descendants, folk of the town and guests came to remember his bravery and unveil the Centenary Victoria Cross Stone. 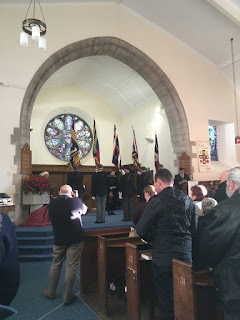 A service was conducted at the beautiful Kirk by the Sea (where the Remembrance Day service was held 2 Sundays ago) with the Lord Lieutenant of Fife (Her Majesty's representative), Provost Jim Leishman, serving Scots Guards, the Scots Guards Association, Police Scotland, and elected members in attendance. 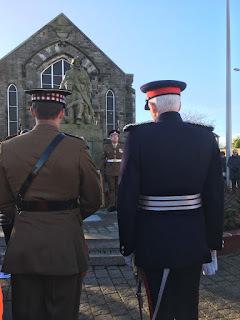 A biography of Sergeant McAulay was read by the Royal Burgh of Kinghorn Community Council's Provost, Alan McIlravie and the Victoria Cross citation read by Major James Kelly. Following a well-attended and moving service, which closed with the National Anthem, a parade led us up to the Kinghorn War Memorial where wreaths were laid and the stone unveiled. 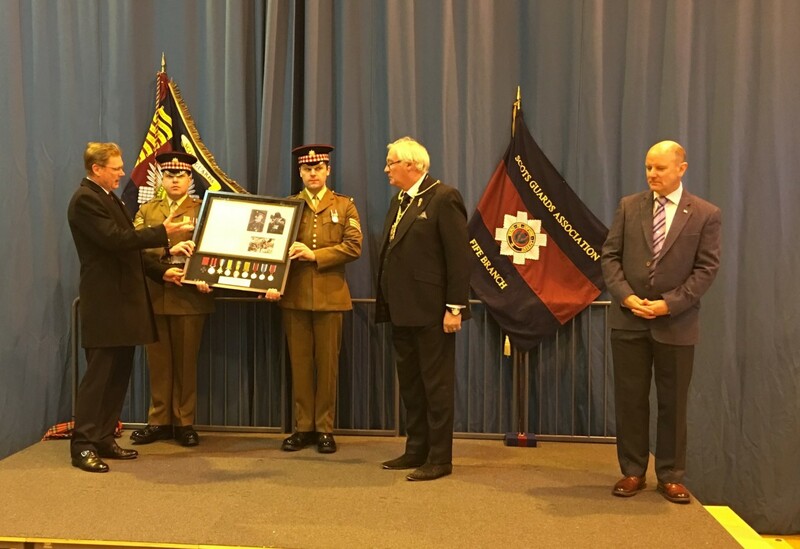 Today all learned of the bravery, gallantry and service of one man in the face of exceptional danger. 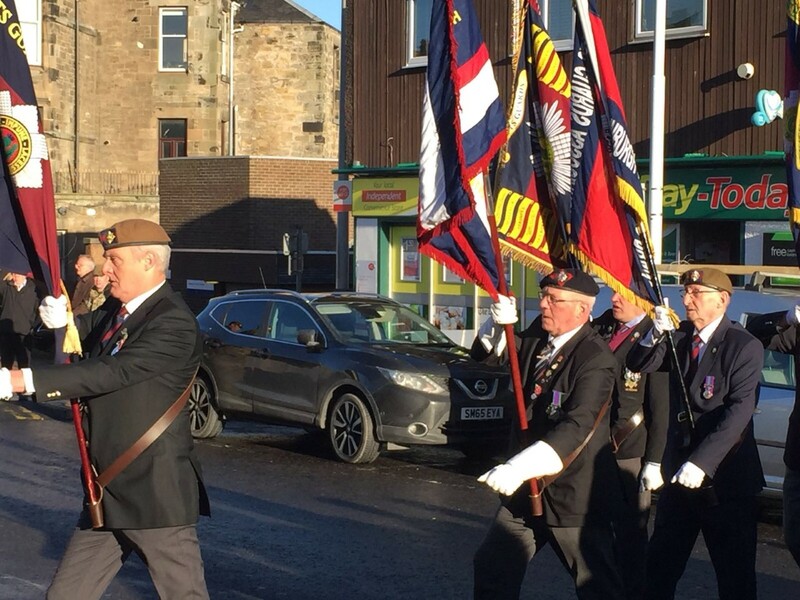 It was also a day when we were all reminded of what millions of young men joined up to and fought for in the First World War and the sacrifice made by so, so many of them. The Centenary Victoria Cross Stone - it has been placed next to War Memorial. 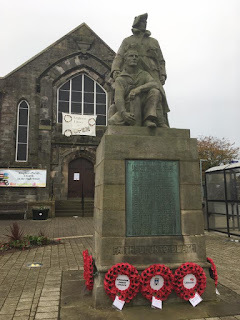 "Lest We Forget"
As I am trying to place regular updates on here this post is some information on what I have been doing over this past week. 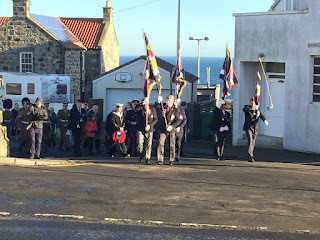 Sunday November 12th started off with the Remembrance Day service at the Kirk by the Sea in Kinghorn. 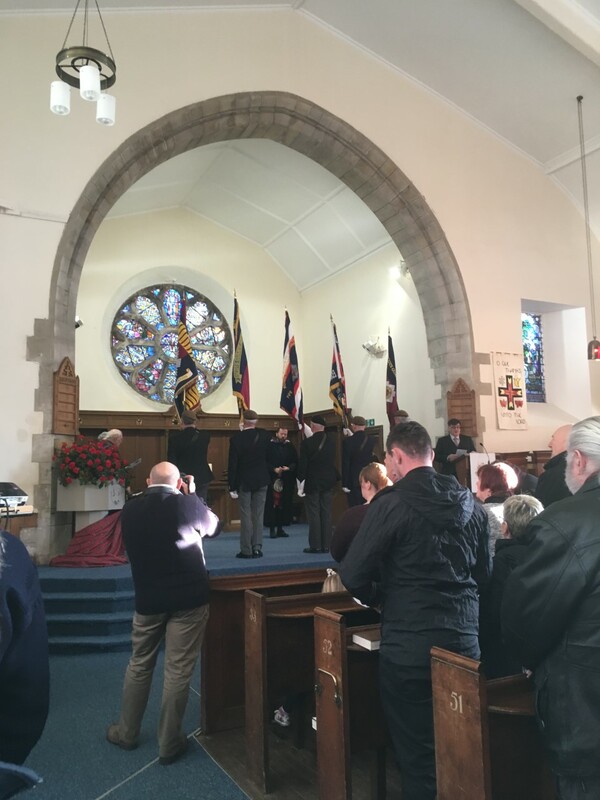 It was a cold and breezy November morning and the church service included a short and very moving interview with surviving Second World War, former POW, Arthur Gunn. His story was a reminder from a veteran of all they had gone through in a war that claimed millions of lives. 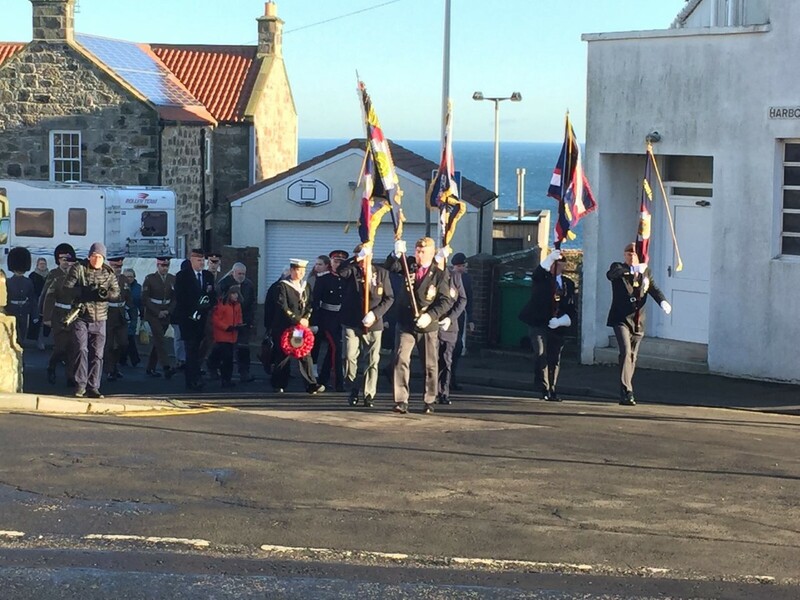 A short procession to the War Memorial after the service and wreaths were laid by the RNLI, local groups and then by myself on behalf of Fife Council, something which was a great honour for me. 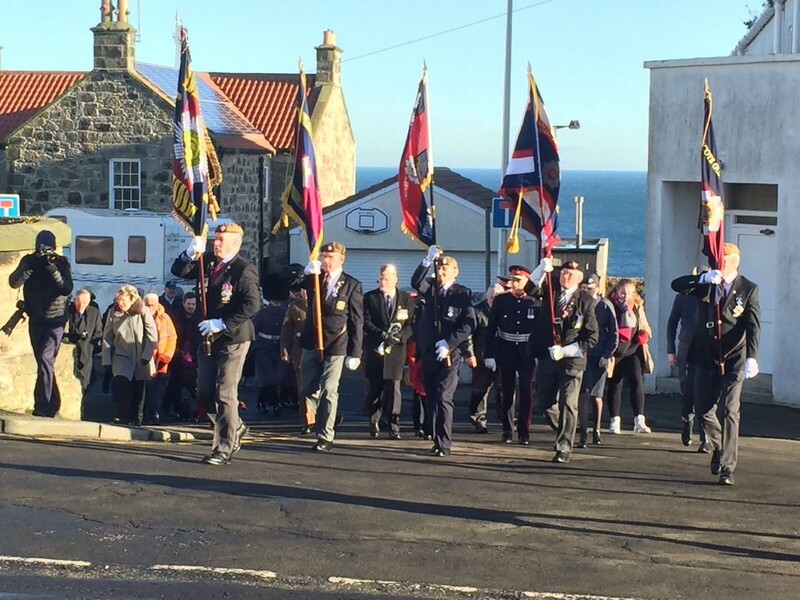 Like countless families across the UK I have grandparents and great-grandparents who served their country in both the First and Second World Wars, with my parental great-grandfather being stationed at the Kinghorn Battery during the First World War. In just over a week's time Kinghorn will mark the centenary of John McAulay who was awarded the Victoria Cross for his role in the Battle of Cambrai. A service will be held in the town which will see some of his descendants attend. I laid the wreath on behalf of myself and the 2 other Ward 9 elected representatives. "Lest We Forget"
Last week was a very difficult and worrying week for employees at BiFab which employs over 1,400 staff (a mix of permanent and agency) across Burntisland, Methil and the Isle of Lewis. The engineering firm was on the verge of administration last week leaving hundreds of Fife workers with uncertainty about their future. 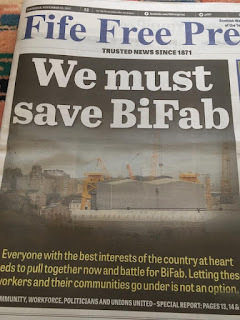 Bi-Fab is currently working on a contract for the Beatrice Offshore Windfarm - the renewables sector being one which the Scottish Government has been keen to promote. The Scottish Government offered a loan if required and the UK Government made it clear they were ready to stand with Edinburgh in offering support. Thankfully a deal to conclude the contract between Seaway Heavy Lifting and JCE Offshore (partners to Beatrice Offshore Windfarm) was reached and work is guaranteed until next April. Local elected representatives will be watching this closely, workers do not need more uncertainty in the lead up to the festive period. I was interviewed by BBC Scotland News and commented in local paper, The Fife Free Press, expressing my concerns and urging for a solution to be found. 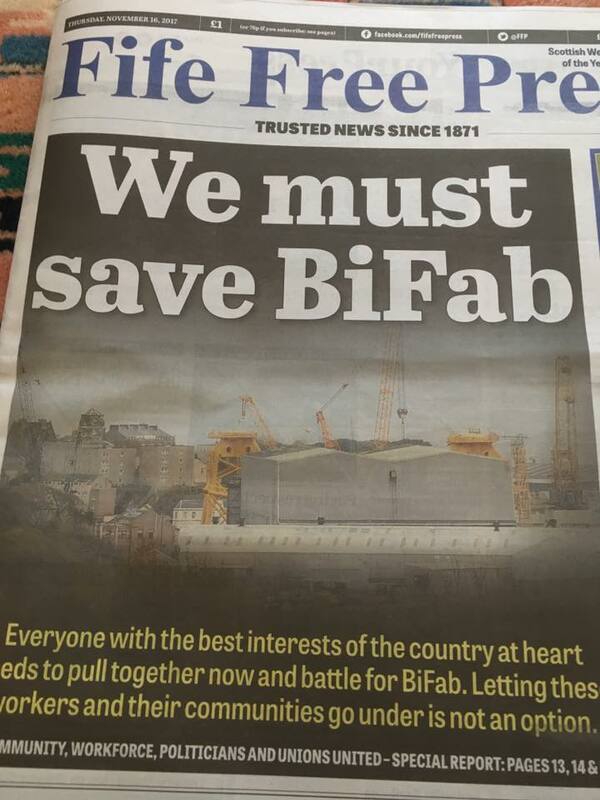 "I am deeply concerned by the potential job losses at BiFab. The Scottish Government is very focussed on the renewables sector. 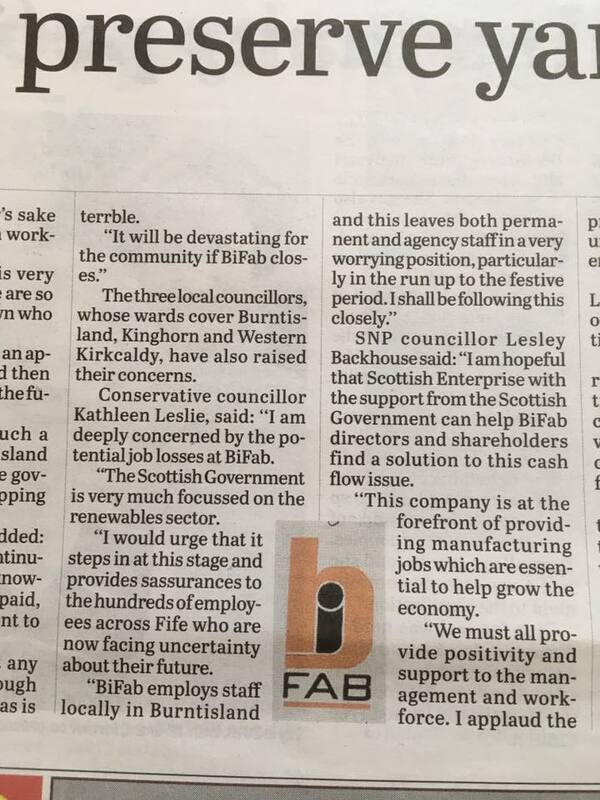 I would urge that it steps in at this stage and provides assurances to hundreds of employees across Fife who are now facing uncertainty about their future. 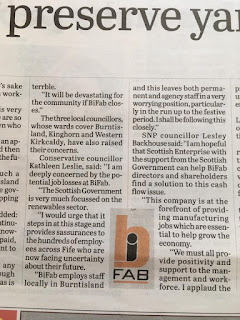 "BiFab employs staff locally in Burntisland and this leaves both permanent and agency staff in a very worrying position, particularly in the run up to the festive period. I shall be following this closely." 1. Poor planning - extensive house-building throughout the previous Administration led to an understanding their would be a capacity issue (this was recognised as early as 2013) and therefore, this sudden rush to rezone. Plans for an additional 240 homes in Masterton have been released this week. If you are going to build houses there has be sufficient and competent local infrastructure in place. 2. 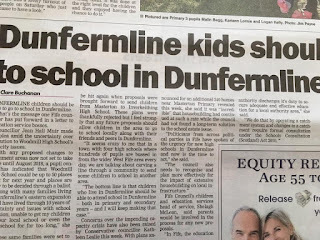 Dunfermline needs new high schools - it is not only capacity but also the condition and suitability of Woodmill, St Columba's and Inverkeithing High School. There is £50 million set aside in the Capital spend for new high schools but the remainder of the money has to be sourced from the Scottish Government. Prior to May's local elections the SNP and Labour were very keen to blame each other in their demands for new high schools. Interestingly both have become deafeningly silent on the need for new schools which is why I made a deliberate point to mention it at Committee earlier this month, a comment that was picked up by local media. 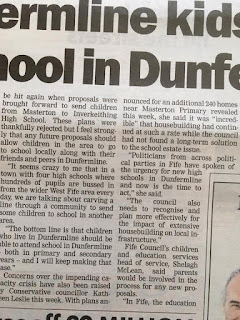 "Politicians from across political parties in Fife have spoken of the urgency for new high schools in Dunfermline and now is the time to act. The council also needs to recognise and plan more effectively for the impact of extensive housebuilding on local infrastructure." 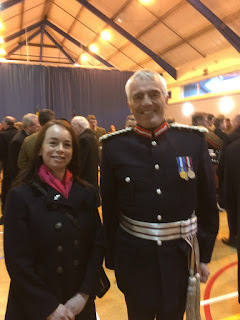 Last week I attended the regular Police Community Engagement meeting in Burntisland, being the last of its kind to still run in Fife, I have been informed. 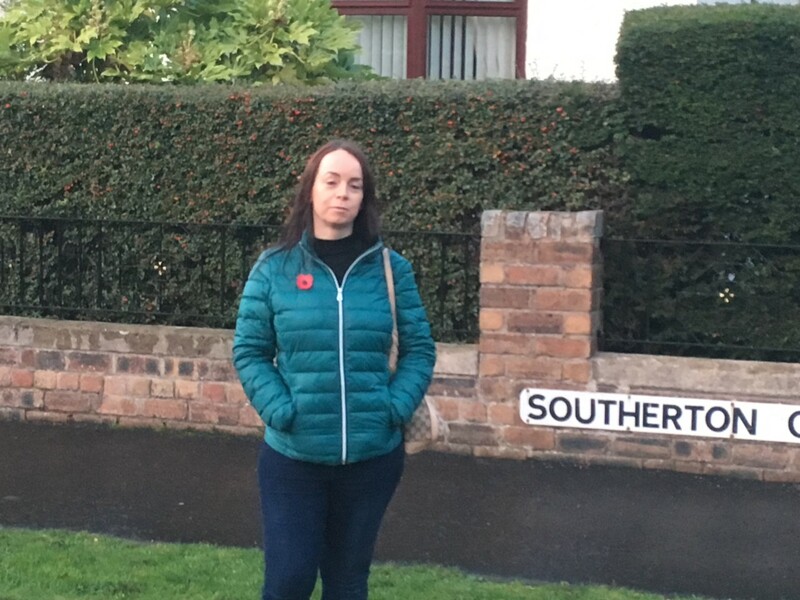 Anti-social behaviour was high on the agenda with me asking questions about youngsters drinking and causing a disturbance at the Castle area around the Haugh Road on a Friday evening, in particular. Youth anti-social behaviour has been a long running issue for residents, not only in the Castle but across the town (and to a wider extent at various pockets across Fife) and whilst I absolutely must stress this is only a very small minority the distress it can cause to residents can be long lasting and impact on their health and well-being, particularly in areas with older residents. 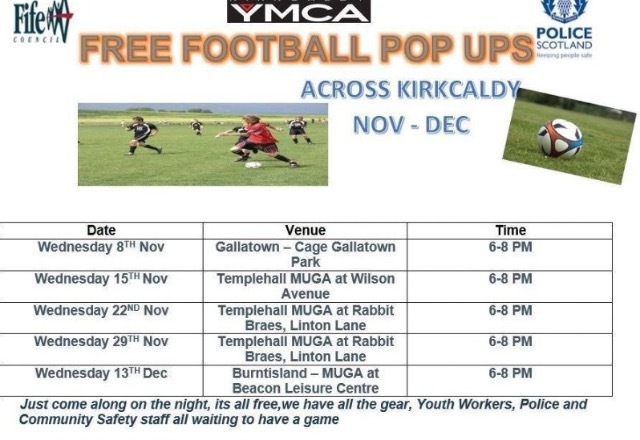 Projects, with success, have been run in the Templehall area of Kirkcaldy which have included football and have involved the community police with the result being a fostering of better relations and a reduction in anti-social behaviour. 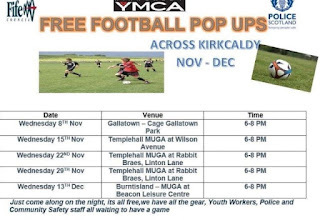 Now a session has been organised in Burntisland to run on Wednesday December 13th at 6pm at the Beacon Leisure Centre, it will be run by the YMCA with youth workers and the police - do come along and give it a go. 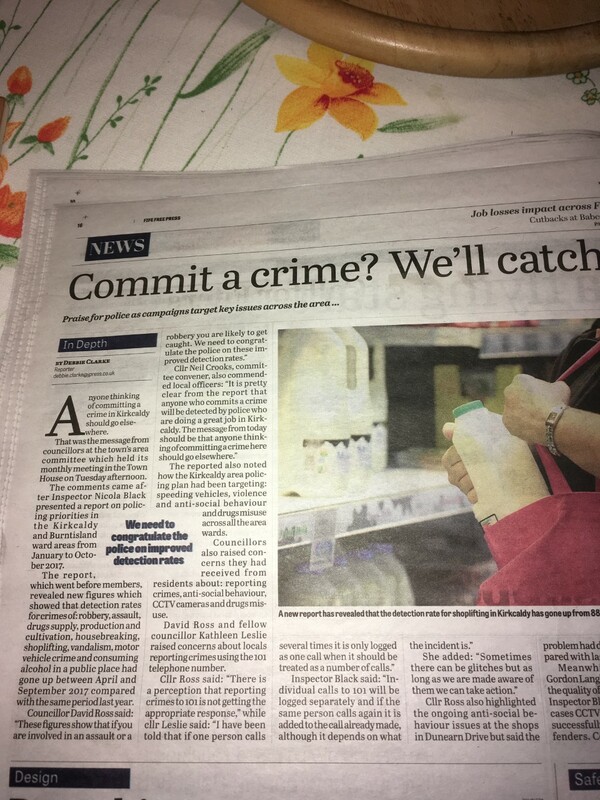 Whilst, I believe, everyone recognises you will never be able to catch the attention of all those who are contributing towards anti-social behaviour, I do think this can and does make an impact and the knock on effect in communities means that trust can be built between the police and local young people. 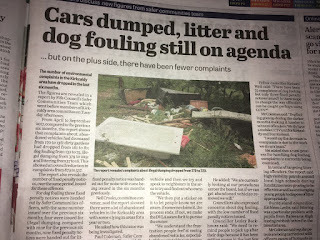 What concerned me the most though was that if one person calls 101 to report anti-social behaviour or other ongoing concerns is if that person calls back later in the day/evening on what is considered to be of the same/ongoing incident that is only logged as one report on the "call card". This troubles me a lot as quite often in a neighbourhood there will be that one person who others will turn to who, often, by default taken on the role of their voice but if that one person makes all the calls it is once incident. In short if you want 5 complaints/concerns logged (and thus, creating more likelihood of a rapid response) you need 5 different individuals to call! Police numbers have suffered greatly under this Scottish Government who centralised all policing in 2013 - thus merging regional police forces who had far greater local knowledge. Frustration has been voiced time and time again about residents having to call a central call centre and then have to actually explain where they are as that link between police and community has been severed. 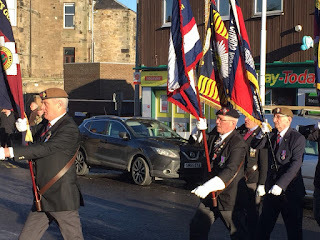 All of the community police that cover Ward 9 are doing an exceptional job but as they themselves have pointed out, 60% of what they do is not crime related and with a focus on Kirkcaldy, smaller towns such as Burntisland and Kinghorn do not always have the coverage of policing they need - particular on weekend evenings. Centralisation of Scotland's police has come at a high cost, a Freedom of Information request obtained by the Scottish Conservatives shows that since April 2013 there have been 1,426 men and women leave the police. Further concern is that the number of discontented staff working for the single force has resulted in one in three wanting to leave within three years and, most worryingly, 3159 have left since the April 2013. This does not make for good reading and when attending meetings such as the Community Engagement one and listening to the very real worries and concerns residents have it does make me wonder what the future holds for our already embattled single police force and of course the widely opposed merger of the British Transport Police with Police Scotland. It all highlights this government's obsession with centralising services and wresting control away from local people and communities. My first "In Touch" leaflet as your Ward 9 Scottish Conservative & Unionist Councillor has begun to be delivered so expect one through your letterbox over the next few weeks. There is lots of information on what I have been working on across the Ward and at Fife Council and also a small survey on the back where you can write to me with any areas of concern that you would like addressed. Alternatively I can be contacted via email or 'phone - see details on "About Me" page on this site. Scottish education is changing, in that I mean the governance of schools - how schools are run, powers held by headteachers, Regional Collaboratives and engagement between school and home. The Education (Scotland) Bill will begin to make its way through Holyrood next year. Now is the time to Have Your Say. A public consultation has now been launched, the Scottish Government believes these changes will "improve educational outcomes for young people" - now is the time to have your say on this. Below are the links to the Scottish Government website page Empowering Schools and then the Consultation itself. Please take the opportunity to participate. This week has been particularly busy at both the Ward and the Council level and I still have one more meeting to go this evening. The week started off on Sunday with me paying a visit to Kirkcaldy to check out a couple of things that I had alerted Council officers to some weeks ago. One was the repainting of double yellow lines on a residential street. This could seem fairly mundane but for residents who are affected by motorists parking along streets where they should not be this is important and of relevance. 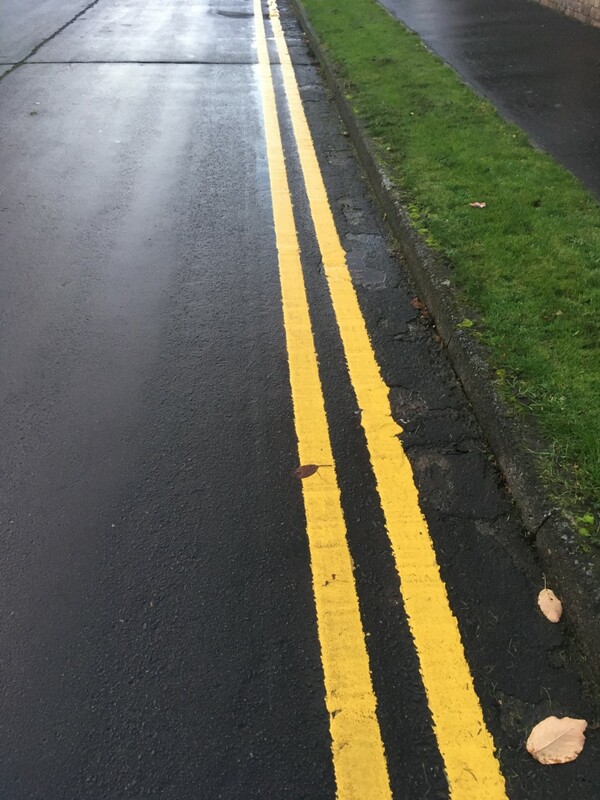 I am pleased to note that Fife Council did act and the lines have been repainted - please do contact me if you note any such issue on your street. Alternatively you can contact Fife Council directly to log the matter - just contact their call centre on - 03451 55 00 11 - this number can be used to report anything from Council housing repairs to faulty lampposts to damaged fences. Or you can give me a call if you fancy a chat! On Monday I held a councillor surgery in Abbotshall Church but was not inundated with residents which is making me consider that possibly this is not the best way to contact residents, I am hearing similar reports from other councillors. 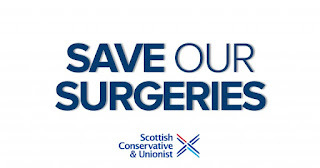 Therefore, the question will need to be considered - do I keep doing surgeries or instead provide the contact information on the usual noticeboards but not have fixed times and dates for them? I tend to find constituents contact me primarily through email and then telephone and of course, through meeting them at TRA meetings, Community Councils and other community groups. Remember - we work for you. My contact details are on this website so do get in touch if you have any concerns, questions, enquiries or suggestions. "Whilst I fully believe this was the best decision at this stage we need to address the wider issue. 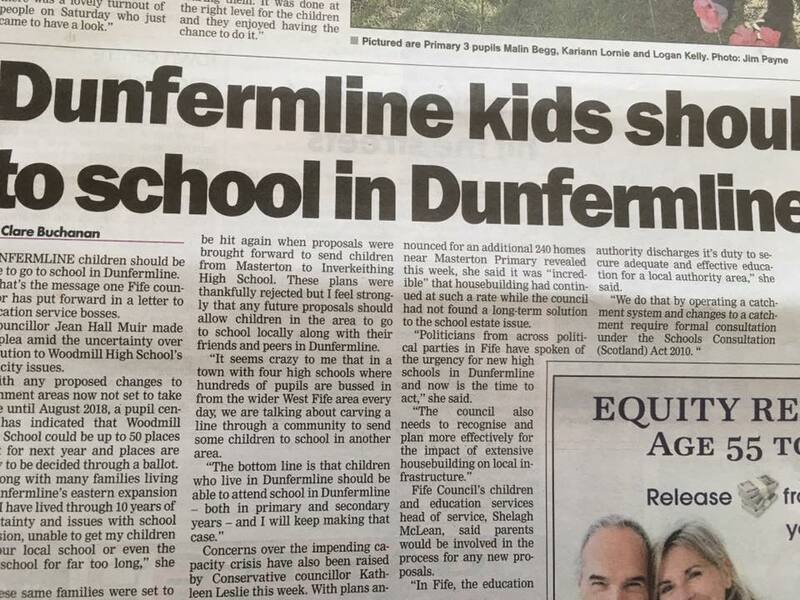 A looming capacity crisis has been created due to continued house building around Dunfermline and no long term solution to the school estate. 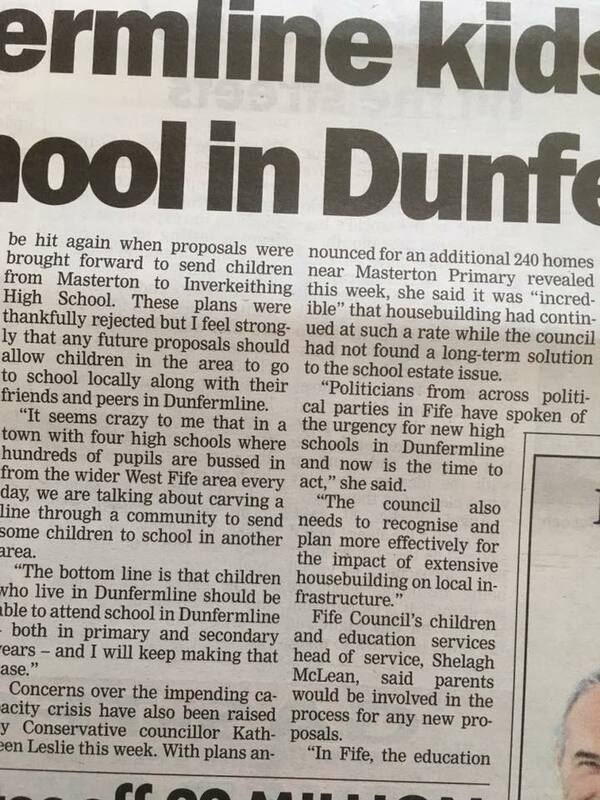 Two of the high schools in the proposal, Woodmill and Inverkeithing, need to be replaced. At this stage Fife Council must begin the process of locating funding for new schools. All pupils deserve to be taught in classrooms and schools fully equipped for the 21st century. Rezoning is a short term solution to a long term problem." Both the above links tie into that discussion rather than starting it again here and repeating the same information. Yesterday was a day of lengthy meetings. Its that time of year when the budget has to be set and for those of us who are Opposition councillors this means setting our "alternative" budget to the Administration. All of us within the group have been tasked with working in small teams to meet with Council Officers and discussing options that are on the table in regards to the local authority's expenditure for the year. I cannot really go into any details on this just now as none of it is public so it is suffice to say that it makes me (and I would imagine most elected representatives) pause for thought when we consider the impact proposed changes could have on others. It is certainly not a task I take lightly and given my own background in education I am well aware of the areas of concern when it comes to funding, once details are public then these conversations can be opened up. The day was rounded off with a meeting organised by Council Officers on PEF - that is Pupil Equity Funding for those unaccustomed to the term - it is an acronym you are likely to hear a lot more about over the coming months. Having sat through committee on Tuesday most of what was covered by officers I had already heard much but as with nearly everything, there is always more to learn. Whilst I have certain reservations about aspects of it and will be following closely how money is spent, I am remaining open minded as ultimately this is about closing the poverty related attainment gap. Youngsters only have one opportunity at education, it is fundamental that they receive every possible opportunity so that all, no matter their background, have the chance to realise their potential. To note schools will publish details on their website of PEF received and where it will be spent. 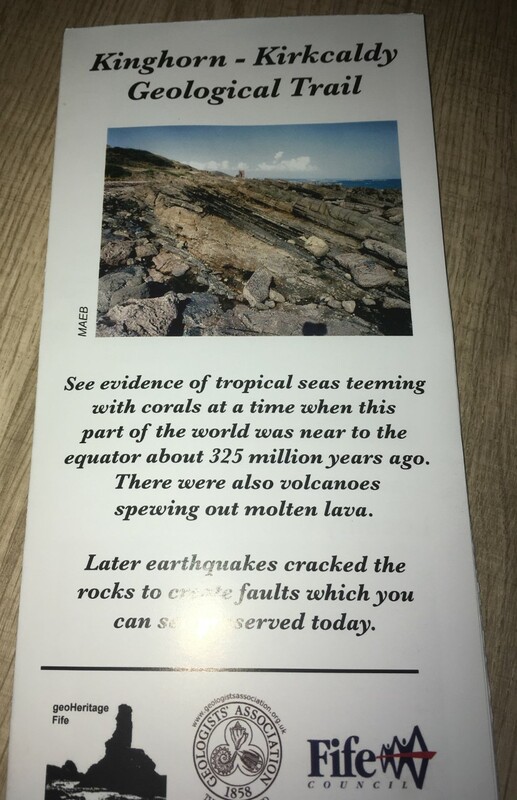 I feel that this is such a vast topic it really needs a whole post dedicated to it, something I intend to do once I have gathered and analysed further information. That leads us to today, Friday. This morning I had a meeting at Fife House which ties in with a number of things written on this post but again I cannot talk about it at this point in the lead up to budget proposals. What I will say I did take from it is - not for the first time since being elected, I am realising that it is absolutely imperative as an elected representative I listen to the various opinions and concerns of a wide body of narrative and thought. Things are rarely as they first appear and rare is it to find a two dimensional issue. Anyway, enough of my opining for today. 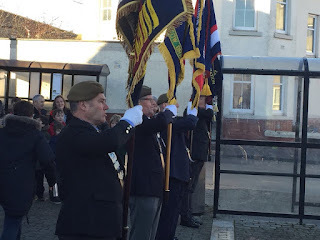 Tomorrow is Armistice Day and then the following is Remembrance Sunday. Please remember to observe the 2 minute silence. 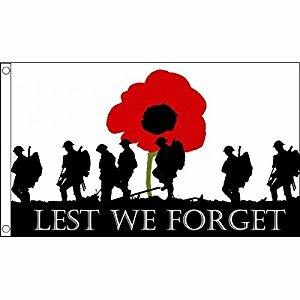 All we have today in our democracy, freedom of expression and free speech - all that makes us what and who we are, is due to those who gave their all in the past. Lest We Forget. I will begin this with apologies to my regular readers, some of whom have contacted me to ask what has happened. There have been a few reasons for my absence on here, one of which is family related, however, having not only missed writing I realise that others have missed my ramblings/rants/thoughts/opinions. In short, I have a voice and I intend to use it. I was elected to represent local people and speak for them and also to represent a political point of view. There can be few (I would very much hope) elected representatives who do not see it as a priority to speak up and speak out and although speaking out can be controversial it is something that anyone in a position to do so should do. Being elected also means to stop and listen - to listen to the voices of those who put us there and remember we are there for them. We are not there to preen our own ego and bask in our success at the ballot box - that, in my opinion, would be a failing of duty. In the words of Britain's greatest leader, Sir Winston Churchill: "Courage is what it takes to stand up and speak; courage is also what it takes to sit down and listen". 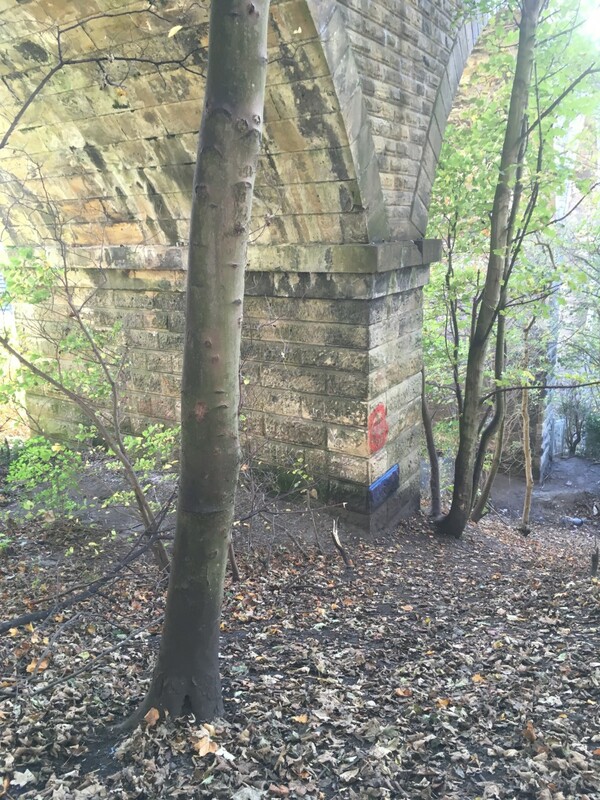 I have also been out and about with the ongoing issue of littering and access around the Invertiel Viaduct. I am very pleased to report that, as promised, the school organised the Community Payback Team to clean up the area at the viaduct where the worst of the litter was - it looks so much better! Now, we just need it to be maintained. I have made an earlier plea about the need to recycle waste, and in particular - plastics. 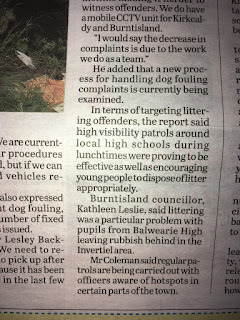 Much of the rubbish lying about was empty water and juice bottles that pupils had been throwing away on their return journey to the school after lunch. 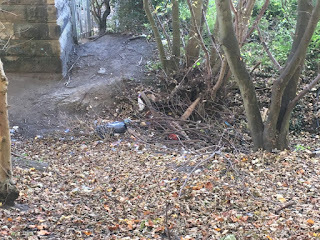 The Tenants and Residents Association (TRA) and myself have now made the suggestion that we meet with school prefects to get them on board in reminding the younger ones to put rubbish into the recycling bins but also to stop them using the route by the viaduct as a shortcut. Last Friday I went with two representatives of the TRA to the school and with staff we headed out (wearing wellies, thank goodness!) to look at the route pupils take. Not only is it incredibly muddy (and I mean some serious mud, my wellies were caked in it) but it is dangerous, I shudder to think how they negotiate the route on a rainy day. Thanks to the Community Payback Team the area looks a lot better. Now the challenge is to ensure it is kept like that. Reduce. Reuse. Recycle. The fence, as I have now discovered does not even begin to close off access at the second arch of the viaduct. I struggle to understand how this was ever allowed to go ahead. 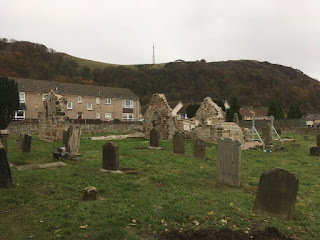 I also attended the Burntisland Castle Neighbourhood Development Plan (NDP) group just over a week ago - I really enjoy these meetings. The interaction and opinions of residents certainly keeps us councillors on our toes! The Castle NDP have been working hard to give residents a voice and to bring things to the local community that local people want and need. One particular issue that has been long running is speeding along the Haugh Road and the need for speed reducing measures. Residents voted back in September that with some of the funding money received they would like to see speed bumps installed, finally these are to be given the go-ahead. 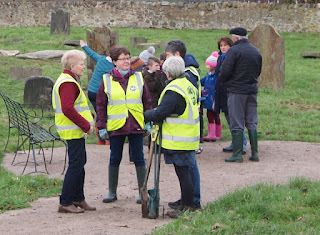 Although this was not a project I was involved in from the beginning I am very keen to see them continue to excel and engage within the community. I have also been informed this week by the community police that 20mph signage along the Haugh Road is minimal - taking a drive along today I noted you have to be around 200m along the road before a small "20" notice appears on a lamppost and there is no signage on the road. 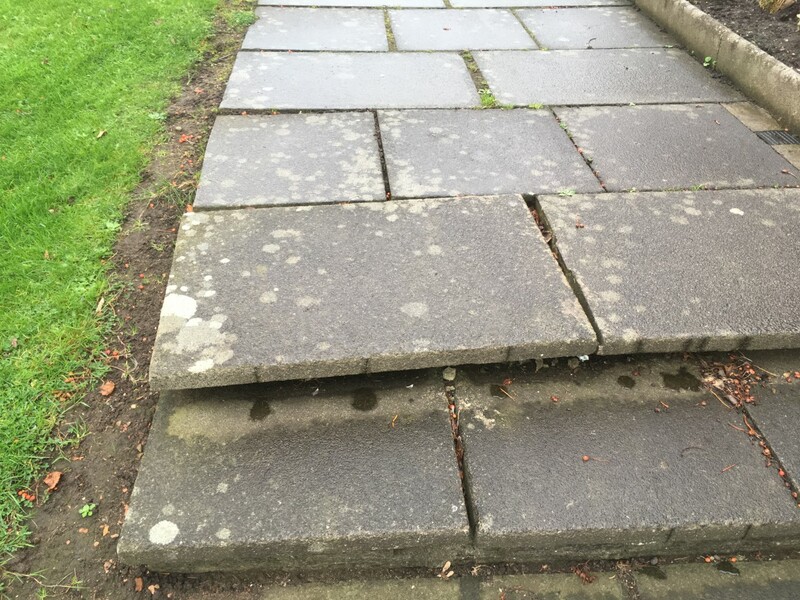 I have taken some photographs and am asking Council Officers to have this remedied. The Youth Action Group also spoke of ways to try and engage with young people in the town and are working to have a youth café up and running (on a Friday evening, I believe), their energy and enthusiasm is something we all need to reflect upon. Both in all my years of teaching and this past few months as a councillor I have heard, albeit from only a few people, that young people are seen to be causing problems and trouble within sections of local communities and whilst there is no denying there are issues, the youth group in the Castle demonstrates how that energy can be harnessed and focused and I look forward to seeing how their group evolves and develops over time. 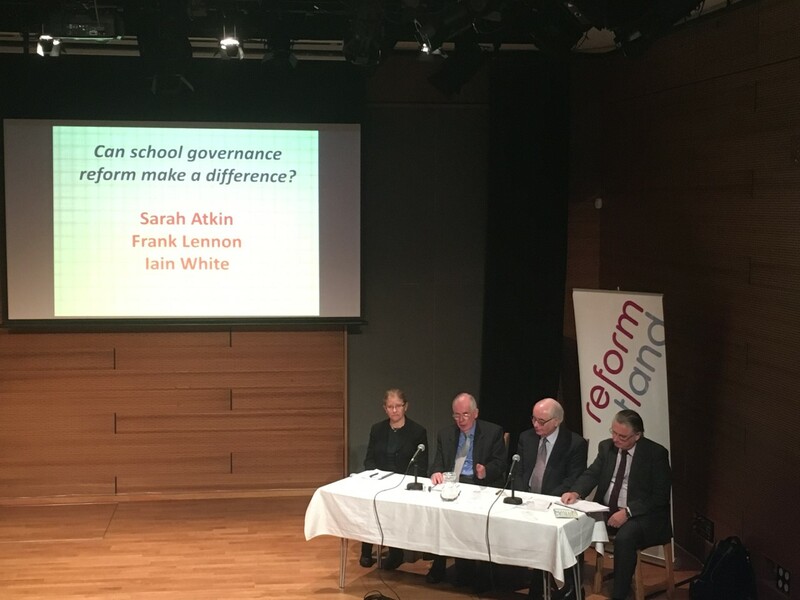 Last week Reform Scotland held a one day conference in Edinburgh entitled "How Does Scotland Compare With Other Countries: Can School Governance Reform Make A Difference". Speakers included the Education Secretary as well as a representative if the OECD - this is a long topic so isn't for this post and as I am currently working on a piece of work relevant to this there is no need to detail it any further at this stage. However, last week's conference provided members of the audience with much to take away and digest, it was also a great opportunity to speak to people from many different fields of work and experience. 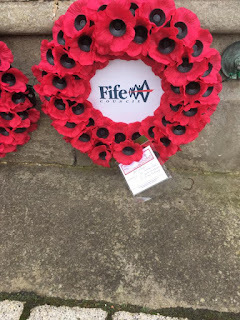 Tomorrow I am off to another conference and and then to get in touch with a number of people at Fife Council to follow up residents enquiries and push for updates on matters I have requested information on. 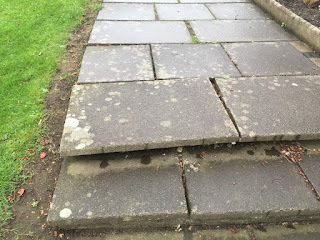 A resident spoke to me about a loose slab on the pavement that could be a potential hazard - this gets reported to Fife Council - remember this is the sort of thing you contact your local representative to act on. My contact details can be found on this page if any constituent has a matter they would like to discuss.